A cat not eating can be a sick cat, or a cat just being a cat. Some cats eat their meals in one sitting like clockwork. Others take their sweet time in eating their meals, returning several times to the dish over the course of the day, and occasionally ignoring their food altogether. It's possible therefore to have a very healthy cat that undergoes brief periods of ignoring its meals. To help determine whether a cat not eating is a cat in need of medical treatment, you really need to understand the daily habits of the cat. If kitty is always there at mealtime, waiting expectantly for its food, then diving right in you may have a legitimate cause for concern if it suddenly appears indifferent to its food, or completely ignores it. A change of habit is a symptom to watch for, and then you need to try to figure out if you can, what brought about this sudden change. Outdoor Cats More At Risk - If you have an outdoor cat, there are a several good reasons why it may suddenly stop eating. A kindly neighbor may be giving it some extra treats or even meals. If your cat has become a finicky eater but still appears healthy, or even is putting on weight, you might ask around to see if someone else is feeding it. Another reason could be stress. Cats are territorial creatures, and outdoor cats have more territory to defend than do their indoor cousins. A cat that has been in a territorial dispute with another cat, has been harassed by a dog, or otherwise seen its territory violated, may suffer a temporary loss of appetite, just as we sometimes do when things aren't going well. A third reason, and a more serious one, is if the cat has either been injured or has gotten into something toxic. This is a situation where you always want to be looking for other symptoms besides an apparent loss of appetite, to see if you need to take your cat in for medical evaluation. 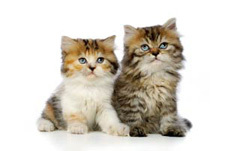 Stress And Routine - Indoor cats are far less likely to become stressed, and tend to live much longer as a result. Stress can happen though. A cat is often not used to having anyone in the house who is not a member of the immediate family. Bringing a new baby home or, worse yet for the cat, introducing another cat or a puppy, can initiate the situation of a cat not eating. Even changing furniture around can stress some cats. They like routine, and like things to be in their proper places. If then, your cat decides to ignore a meal, think back on the day's activities to see if there may have been something, no matter how slight, that has taken the cat out of its routine. A common reason for a cat not eating is that something has changed in its food. Usually this happens when we find a bargain on a different brand of cat food, or feel that the food we've been giving kitty is getting a bit too expensive. Canned tuna is canned tuna, or so we seem to think. A change in brand can be very noticeable to a cat and it may turn up its nose to the new brand and not eat it until it becomes very, very hungry. If you must downgrade your cat's food from designer tuna to something a little more proletarian, try mixing in a bit of the new with the old, and gradually increasing the amount of the new brand. Maybe you can fool kitty into believing that nothing drastic has changed. Maybe you can't. Look For Other Symptoms - If you cat hasn't eaten anything in 24 hours, there is a very good chance that it has a problem that needs to be attended to. Also take note of the cat's temperament, and whether it is seeking a secluded place to go to, as ill cats often will do. A sick cat will also forgo water at times, and that's another thing to look for. Obviously, you can't follow your cat around for every minute of the day, but you do need to be on the lookout for changes in its behavior or habits. If you do observe such changes, you should take the cat to the veterinarian for evaluation. If the cat's condition is not something too severe, the veterinarian may simply prescribe an appetite stimulant. Giving your cat such medication is something you never should do on your own, even if the medication is considered safe, and easily obtainable over the counter. Rely on your veterinarian’s good advice, so you won't be doing something to put your cat in danger. Chances are that the situation of a cat not eating will happen from time to time and is usually nothing serious. We all know that a cat enjoys being a cat, and enjoys doing what it feels like doing, and not doing what it doesn't feel like doing, including eating. Take into account the 24-hour limit, and look for other symptoms or changes in behavior, and you'll likely end up doing the right thing.